When families imagine the snowy winter landscape of Lapland, they no doubt picture a snow-covered wooden cabin tucked amongst the trees – the windows emitting a cosy inviting glow and smoke from the fire blowing merrily from the chimney. In many of our destinations, this image can be a reality and we have a range of log cabin-based holidays for families to choose from. As well as their obvious charm, log cabins are a great base for families that want their own private space away from the main hotel building. They offer a sense of adventure and escapism too and, after a day of activities in the snow, they are a lovely place to return to, relaxing in comfy chairs or (in some cabins) by the wood burning fire or in the private sauna. They give you the chance to have your own little ‘home from home’ during your stay. For families, cabins also have the added benefit of additional amenities that might not be available in hotel rooms, such as small kitchenettes with fridges, microwaves and tea and coffee making facilities that can often make travelling with children a little easier. Where can I go to stay in a log cabin? On our family experiences, we have a variety of cabins and cottages available from traditional log cabin style to more modern winter cottages. For those who want a cosy cottage in the woods, Jeris, in North West Finland remains our most popular destination. Here families can choose from a range of cottages that can sleep from two to seven people, all located in the snow-topped forest. As well as bathroom and bedroom facilities, they all have a kitchenette and lounge area and the added bonus of their own private saunas and log burners. In most cottages, there is a loft/mezzanine sleeping area which older kids tend to love (parents do need to be aware however that these are accessed by steep steps and should not be used for small children). Another sought after location with families is Luosto and the Tunturi hotel’s log cabins. These are just a very short walk from the hotel which is perfect for families that still want to enjoy the hotel amenities (such as its spa and swimming pool) but are also looking for a private retreat. These are relatively small cabins but are exceedingly cosy and offer the charm of the traditional log build. 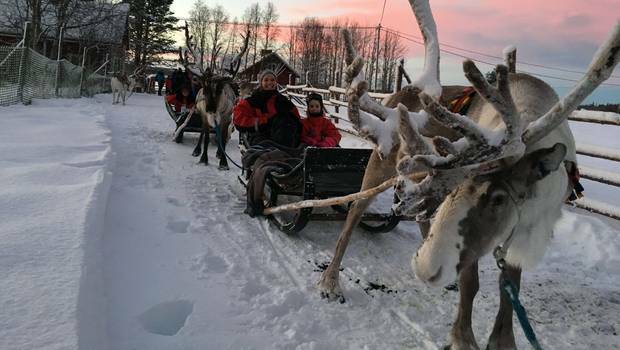 If your family wants a more modern cottage option then you might want to take a look at our Brandon Lodge experiences in Swedish Lapland. Here you can enjoy a simple Scandinavian style base complete with kitchen and en-suite shower rooms. These cabins also have the added benefit of a porch or terrace from which you can look out across the frozen sea. Whilst the benefit of the cabins is that you can enjoy a sense of escapism with your family, this does, of course, mean that you are set apart from the main amenities of your chosen accommodation and the restaurants where your meals are served. Cabins are often only a short walk away, however, and with your cold weather clothing, you will stay warm as you make your way to the main building (where you will enjoy your meals). If you don’t fancy the idea of having to put on your snow gear and snow boots each time, then a hotel room might be a better option for your family (some hotels do offer family rooms and suites – ask our Travel Experts for details). At Jeris, the cabins are all situated around 15 to 25 minutes from the main hotel so you will have to walk this route for the meals – however, it is a lovely scenic walk through the snow and the little ones can be pulled along on a sledge, so it’s not necessarily a hardship! We highly recommend taking supplies of your favourite hot drinks with you in order to make use of the kitchenette facilities – it just gives you that added flexibility to create your own drinks and snacks as required. Please contact our Travel Experts if you have any questions.